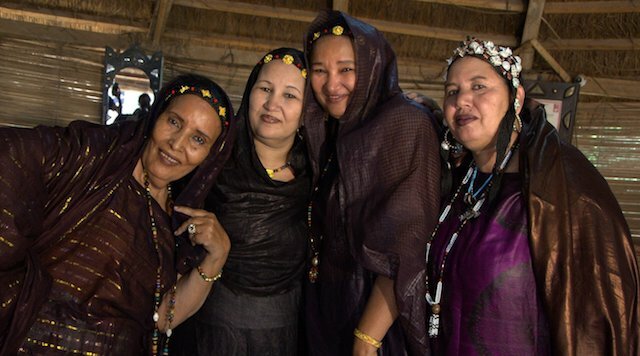 Although a dozen years have passed since Tartit released its acclaimed album Abacabok back in 2006, the group remains steadfast in its mission to spread the message of love, peace and the political conditions of the Tuareg people. Amankor/The Exile is a return to their hypnotic best, with heartfelt songs full of nostalgia for their homeland and a call for solidarity and a united approach towards reconciliation. Recorded live at Akan Studio in Bamako, the album has a raw and authentic edge true to the band’s musical ethos. 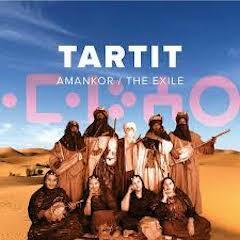 Originally created to safeguard the Tuareg traditional music, which was slowing disappearing, Tartit’s members all originated from the Timbuktu region and formed the group while in exile between Mauritanian and Burkinabe refugee camps in the mid-‘90s during the Tuareg uprising. Fast forward a quarter of a century, and with the help of friends and aid agencies the band has played all around the world at many of the biggest world music festivals in Europe, North America and beyond, achieving iconic status along the way as guardians of Tuareg music. With their traditional instrumentation and repertoire their music speaks directly to the issues of today, seeking to preserve a culture under attack. Amankor/The Exile offers a unique perspective on Tuareg life through a woman’s eyes on songs such as “Tiliaden N’Asahara,” translated as “The Girls Of The Sahara,” which depicts the hardships of daily life, and how despite the lack of water, education and healthcare they still love the Sahara and ask for the world to help revive it. In Tuareg society women enjoy equal rights to men, and their importance in looking after the family is the subject of “Tamat/The Woman,” which warns how “The woman is the central pillar of the tent, and if the pillar falls, the whole tent will fall.” A short a cappella song, “Haoua,” is a heartfelt lamentation of a mother who was robbed of cattle in the absence of her son, bringing home the life or death existence that is living in the Sahara. Nostalgia is very much a central theme of the album with “Asaharaden” being a reminiscence about how the Sahara was once peaceful and wondrous before becoming divided by war. Despite these deep regrets for what has been lost, Tartit remains a beacon of hope for the Tuareg people and offers hope for a brighter future on the album opener “Afous Dafous” (meaning “Hand In Hand”), a song inspired by a children’s game that encourages unity and solidarity. No other track epitomizes everything the band represents more than “Tanminak” with the words “We share the same land, we have to be united, so let’s reconcile,” being a message that these ambassadors of Tuareg traditional culture continue to spread far and wide.